: Duke of Portland, KG, GCVO (Welbeck Abbey). 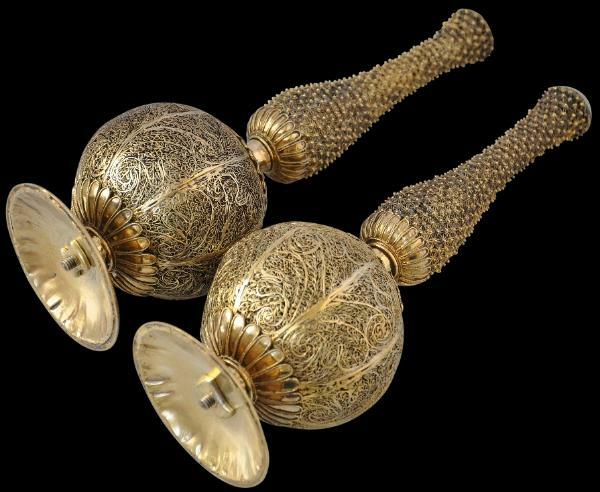 This superb pair of silver-gilt filigree rosewater sprinklers comprise spherical bodies of tightly set fine filigree, with baluster necks done in a fine floral-pattern filigree trellis. A small solid spherical granule has been applied to the centre of each flower motif given the necks a particularly ‘spiky’ appearance compared with other similar extant sprinklers. The sprinklers sit in low, flared feet and have domed tops perforated with tiny holes to emit the rosewater. The bases and tops of the spherical bodies are bordered by wide petal bands that mirror the motifs employed on the feet. Each of the pair has a central hollow tube that functioned as the well for the rosewater. The narrowness of the tube allows light to pass through much of the filigree giving the pair the appearance of fineness and lightness more than is usual. The pair has as its provenance, the Duke of Portland. The pair is listed in the 1935 inventory of the then Duke’s collection of silver housed at Welbeck Abbey, the Duke’s country seat. (see Jones, 1935, p. 8). 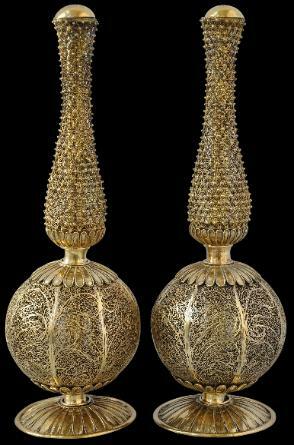 They are listed as: ‘A pair of filigree bottles with globular bodies. Height, 8 3/4 in. Maltese (? ), early 19th century’. The dating and origins were a likely best guess. It is not clear how this pair entered the collection. However, Jones’ introduction to the inventory mentions that the family’s collection of silver is the result of several family inheritances, including a quantity of silver items brought to England by Hans William Bentinck, a Dutch and English nobleman who became the first Duke of Portland. Bentinck lived in England and Holland variously in the late 17th century and in 1690 was sent by William III to The Hague on a diplomatic mission. It is doubtful that the sprinklers are as early as this but the family’s early origins in and connections with underscore the possibility that the sprinklers are the product of United East India Company or Vereenigde Oost-Indische Compagnie (VOC) related workmanship in Batavia (or possibly China) and were exported to Holland from where they were acquired by the family and brought to England. Later, the family had close connections with India. Lord William Henry Cavendish-Bentinck (1774-1839), the second son of the third Duke of Portland who served as prime minister, himself served as Governor of the Madras Presidency from 1803 to 1807. He was made Governor-General of the Presidency of Fort William from 1828 to 1833. He was appointed to turn around the loss-making East India Company so that its charter would be renewed by the British government. The role was refashioned as Governor General of India in 1833. Bentinck carried on in this role until 1835. The outlawing of suttee, the practice whereby Hindu widows were expected to throw themselves on their deceased husband’s funeral pyres, was one of his reforms introduced whilst Governor General. It is possible that the rosewater sprinklers entered the Portland collection at this time. It is unlikely that the sprinklers were made in India but sprinklers made in Batavia, China and elsewhere were made for the Indian market as much as for the local and European markets. Filigree sprinklers of similar form are in the toilet set of Catherine the Great, now in the Hermitage. These are attributed to China, 1740-1750. The pair here differ in several important respects. The filigree on the bodies are more scrolling and less ordered than on the Hermitage set; the necks are far more spikier; and the construction is quite different: the Hermitage set comprise filigree over silver sheet, whereas in this set the filigree is entirely stand-alone. A pair not unlike the Hermitage pair is in the Clive Collection at Powis Castle, Wales (Archer et al, 1987, p. 127). The uncertainty surrounding the origins of eighteenth century silver filigree work is suggested by the inventories for the collection. In 1774, they were listed as an ‘Indian box containing two filigree rose water bottles. In 1775, they were described as two ‘curious Chinese’ rosewater sprinklers. 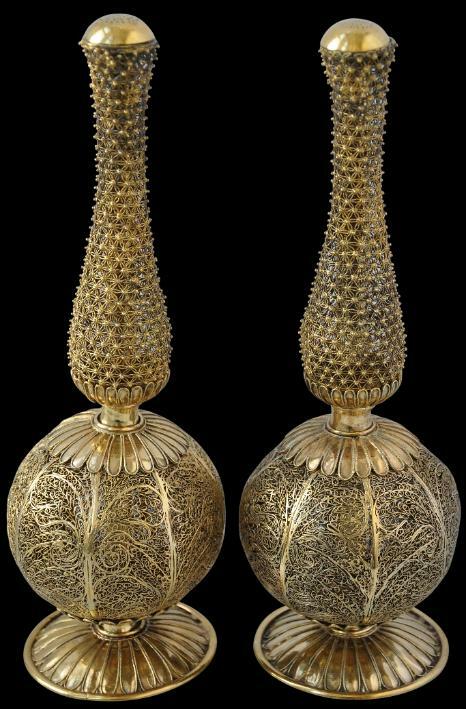 Silver filigree work such as shown on this pair of sprinklers was being done in the eighteenth century in China and Batavia and probably other centres as well such as Manila and Malacca. Related work was also being done in India and Sri Lanka at around the same time. The exact origins of much of the filigree from this time is obscured because much of it was handled by large European trading houses such as Holland’s VOC. Batavia was the VOC’s most important Asian operation. It was the administrative, managerial and maritime centre of the Company’s Asian activities, and far exceeded its other posts in terms of size and importance. The products bought by the Company from across Asia were shipped to Batavia from where they were trans-shipped to Europe and elsewhere in Asia (Stevens, 1998, p. 88). Also, Batavia became an important producer of luxury goods which traders from many parts of Asia exchanged for textiles, porcelain, coins and medicinal products from China, India and the Arab world (Gelman Taylor, 2009, p. xxviii). The silver was produced in Batavia’s artisan quarters (Ambachtskwartier) in workshops that employed silversmiths of European, Indian, Chinese and Tamil descent. The output, referred to as ‘Company’ or ‘VOC’ silver often employed Chinese or Islamic motifs rather than Dutch ones. Hallmark regulations existed for VOC silver from 1667 but these were largely ignored until laws for their better enforcement were introduced in 1730. But free Indonesian, Chinese, Muslim and Mestizo silversmiths were not required to hallmark their work even after 1730 unless they had converted to Christianity, (de Filippis, 2009). And not all silverwork was for the company. There were ‘free’ tradespeople and merchants who operated alongside the VOC. Similarly, not all the silverwork produced in Batavia was for export. Items were also commissioned for use locally. Welbeck Abbey passed through an heiress into the Bentinck family in the eighteenth century and became the main seat of the Earls and Dukes of Portland. Their descendants still live on the estate. Since 2005, it has been the home of William Parente, the only grandchild of the 7th Duke and Duchess of Portland. Lady Anne Cavendish-Bentinck, the elder daughter of the 7th Duke, lived on the estate at Welbeck Woodhouse, up until her death in late 2008. The condition of this set is excellent: there are trivial losses to the filigree but otherwise it is in near-perfect condition. See lot 118, Sotheby’s London, ‘Arts of the Islamic World’, October 7, 2009, for a related pair. : Duke of Portland, KG, GCVO (Welbeck Abbey). Archer, M. et al, Treasures from India: The Clive Collection at Powis Castle, The National Trust, 1987. Filipinas: Puerta de Oriente de Legazpi a Malaspina, Sociedad Estatal para la Accion Cultural Exterior, 2003.
de Filippis, M., ‘Margrieta van Varick’s East Indian goods’, in The Magazine Antiques, September 2009. Haags Gemeentemuseum, V.O.C. – Zilver: Zilver uit de periode van de Verenigde Oostinische Compagnie 17de en 18de eeuw, 1983. Jones, E.A, Catalogue of Plate Belonging to the Duke of Portland, KG, GCVO, at Welbeck Abbey, London, 1935. Singh Bansal, B., The Lion’s Firanghis: Europeans at the Court of Lahore, Coronet House, 2010. Stevens, H., Dutch enterprise and the VOC, 1602-1799, Rijksmuseum Amsterdam, 1998. Tchakaloff, T.N. et al, La Route des Indes – Les Indes et L’Europe: Echanges Artistiques et Heritage Commun 1650-1850, Somagy Editions d’Art, 1998. Zandvlieyt, K. et al, The Dutch Encounter with Asia 1600-1950, Rijksmuseum Amsterdam, 2002.